2016 23' Sportsman with a 250 hp Yamaha four stroke with warranty until 9/1/2020. This boat looks like new and has low hours. All cushions and Eisenglass are in great shape. Boat has Simrad Nss evo2. This unit has chart plotter, fish finder and engine monitoring all in one screen. This vessel is priced to be the next 23' Sportsman sold. 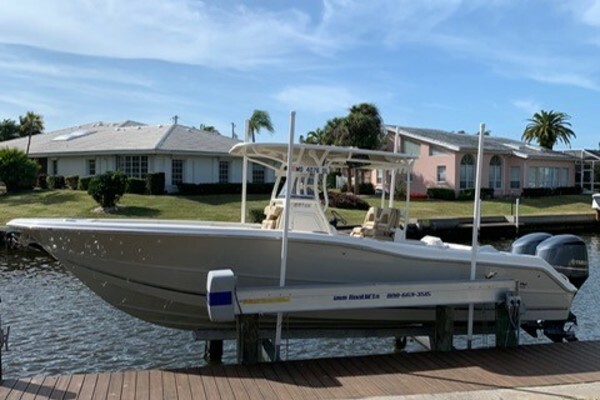 West Florida Yachts would love to guide you through a personal showing of this 23' Sportsman 23 Center Console 2016. This yacht for sale is located in Longport, New Jersey and priced at $49,500. For a showing please contact us by filling out the form on this page and we will get back to you shortly! The 23 Sportsman has seating options throughout the entire boat. The aft bench seat is collapsible for the days you are fishing. The forward bow seats have wrap around cushions with backrests. The large fiberglass hardtop supported with oversized powder coated piping will protect you from the sun. There is storage under the forward seating as well as in the leaning post. Rod storage under both gunnels and a aft bulkhead live well. Like new boat for much less!